Collagen and elastin are two types of proteins that form the fibrous component of the connective tissue. Collagen is wide spread in the body than elastin. The main difference between collagen and elastin is that collagen gives strength and flexibility whereas elastin returns the stretched structures into the original shape. Collagen is a white color protein whereas elastin is a yellow color protein. Collagen is the third abundant protein in a mammal’s body. It is found in connective tissues as well as in skin, tendon, ligaments, and bones. Elastin is the major protein found in elastic connective tissues. It is mainly found in blood vessels and skin. Collagen is the main fibrous protein in the body. It is mainly found in the extracellular matrix of connective tissues. Collagen makes up the 25% of the total protein mass of a mammal. Collagen mainly comprises of amino acids, glycine and proline. It also consists of hydroxyproline and arginine. The collagen is stained in pink in H&E staining. Fibroblasts in the connective tissue secrete collagen as procollagen. Vitamin A, vitamin C, and copper are required for the production of collagen in fibroblasts. The cleavage of the end amino acids in procollagen forms the collagen, which ultimately aggregates into fibers. A collagen molecule is composed of three protein chains wrapped around each other, forming a helix. A large collagen aggregate is called a tropocollagen, which is formed by the aggregation of collagen fibrils. Collagen fibrils are cross-linked together in order to achieve a large tensile strength. Around 15 types of collagen are found. Type I collagen is the most abundant among them. The type I collagen can be found in skin, cornea, tendon, ligaments, and bone. The basal lamina of the skin is formed by type V and VI collagens. The type VI collagen anchors the basal lamina of the skin to the underlying connective tissue. 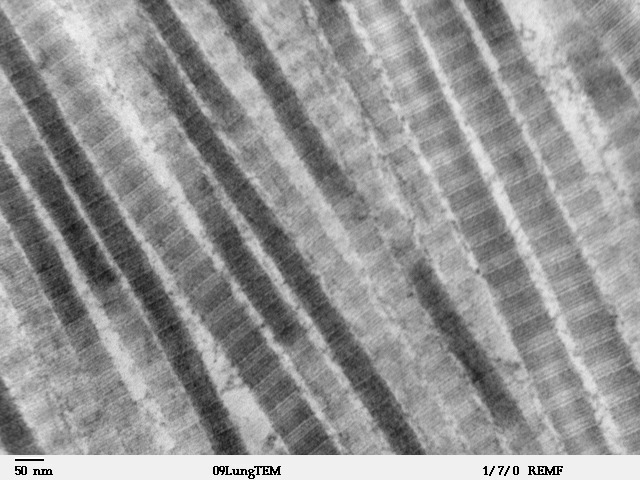 Collagen fibers show a 64 nm banding pattern under the electron microscope. 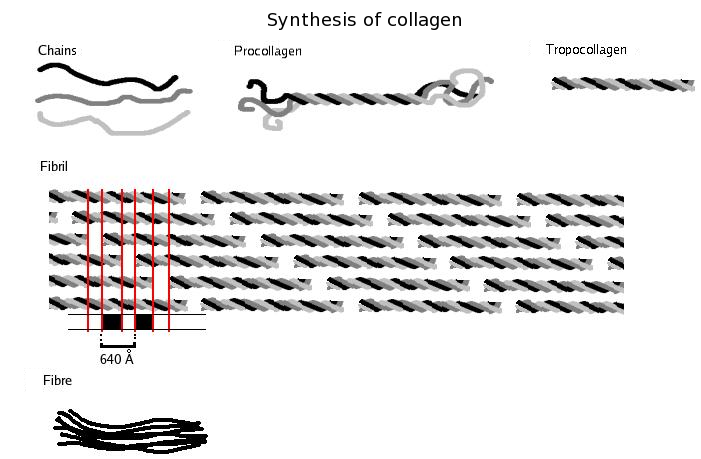 The formation of collagen fibers is shown in figure 1. The main function of collagen is to provide strength to the structures of the body. Collagen is also involved in protecting the body from pathogens, toxins, and cancerous cells since collagen hold the internal structures together. Collagen is also found in tendon, ligaments, and bones. It is found in blood vessels, smooth muscles, digestive tract, gallbladder, kidney, and heart as well. The collagen production slows down with age, weakening the structures. This cause thinner and easier damaged skin, skin sags and wrinkles, and joints get stiff. An electron micrograph of collagen is shown in figure 2. Elastin is the major protein in the connective tissue found in elastic structures. It gives a snap back property to the structures when they are stretched. The production of elastin occurs in the early developmental stages and the childhood. The major protein component of the blood vessels is elastin. Therefore, the loss of elastin may cause atherosclerosis. The loss of elastin in lungs cause emphysema. The half-life of elastin is 70 years. The loss of elastin in the skin decreases the flexibility of the skin and reduces wound healing ability. Fibroblasts produce tropoelastin, which becomes elastin in the extracellular matrix. Human elastin is capable of penetrating the skin and incorporating to the extracellular matrix. Elastin in both younger and older skin is shown in figure 3. Both collagen and elastin are proteins which form the fibrous component of the connective tissue. Both collagen and elastin are produced by fibroblasts. Both collagen and elastic give strength and flexibility to body structures. The decreased production of collagen and elastin in the body leads to the wrinkles and leathery skin. Collagen: Collagen is a main structural protein found in skin and the connective tissue. Elastin: Elastin is a major structural protein in the connective tissue of the elastic structures. Collagen: Collagen is the third abundant protein in the body. Elastin: Elastin is less abundant than collagen. Collagen: Collagen is white color protein. Elastin: Elastin is a yellow color protein. Collagen: Collagen is found in the connective tissue, skin, blood vessels, corneas, muscles, and bones. Elastin: Elastin can be found in blood vessels and skin. Collagen: Collagen gives strength to the structures. Elastin: Elastin makes the structures elastic. 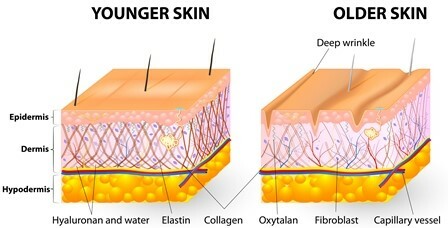 Collagen: Collagen is produced throughout the life until ageing begins. Elastin: Elastin is mainly produced in the fetus. It is no longer produced after puberty. Collagen: Collagen is affected by sunlight, autoimmune disorders, high sugar consumption, and smoking. Elastin: Elastin is affected by sunlight, changes in weight, dehydration, lack of sleep, stress, and smoking. Collagen: Deficiencies in collagen form osteogenesis imperfect, chondrodysplasias, and Ehlers-Danlos syndrome. Elastin: Deficiencies in elastin form Marfan’s syndrome, atherosclerosis, and emphysema. Collagen and elastin are two fibrous proteins in the connective tissues. Both collagen and elastin are secreted by fibroblasts. Collagen provides strength to the body structures whereas elastin provides a snapback property to the body structures. 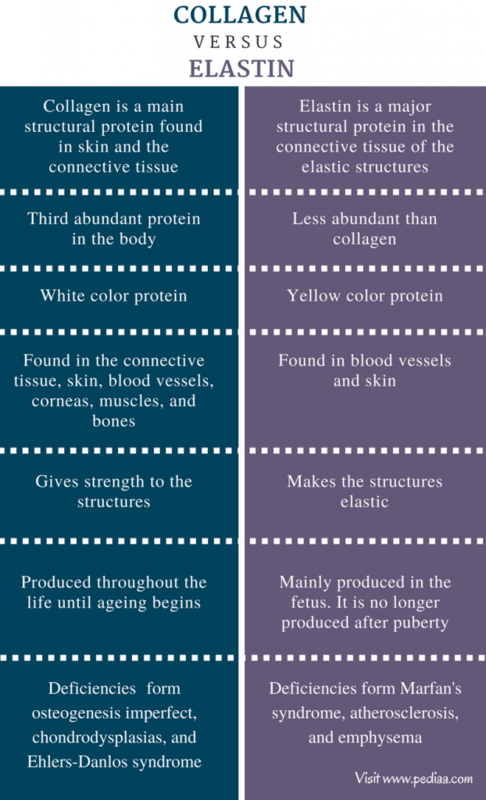 Therefore, the main difference between collagen and elastin is the function of each protein in the body. 1. Mandal, Ananya. “What is Collagen?” News-Medical.net, 8 Sept. 2014, Available here. Accessed 18 Aug. 2017. 2.“What Is Elastin? – Definition & Explanation.” Study.com, Available here. Accessed 18 Aug. 2017.